I’ve moved my homepage and identity to river.cat. I’m a cat called River so it make sense, but that’s not what the .cat domain is for. It’s for Catalonia, intended to promote Catalan language and culture. As part of the deal, I’m going to do that. It’s not too hard, because Catalonia has something in common with Scotland, where I am from. Catalonia is a nation of people located around the area of North East Spain and the border with France. They have been fighting for independence from Spain for some time, much like Scotland has been from England. 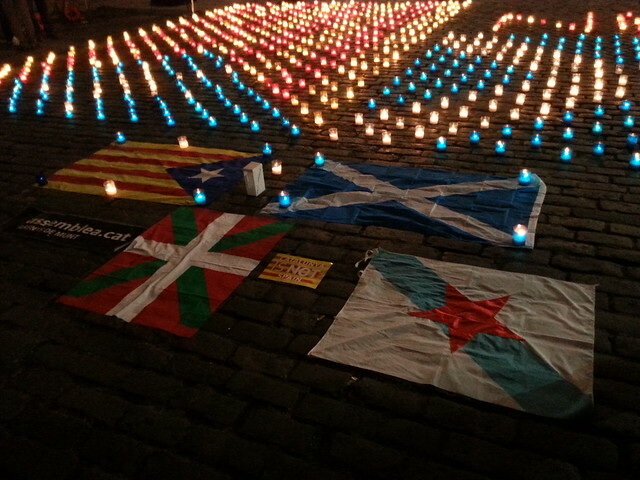 On the night we awaited the result of the Scottish independence referendum, there were both Scottish and Catalonia independence flags on the Royal Mile in Edinburgh. Unfortunately Scotland lost, I think partly because some people were swayed by lies from England of better conditions for Scotland, which were then of course not implemented. More recently, on the 1 October 2017, Catalonia held an independence referendum which returned 90% in favour. This was after serious fighting with Spanish police who tried to stop it happening by beating voters and stealing ballot boxes. It’s an interesting idea of democracy where a country is attacking its citizens to try and force them not to vote. The Catalan government declared independence. Unfortunately it seems noöne actually tried to enforce this, and Spain took control. I had hoped that the Catalan police and people would stand up to the Spanish police who were brought in. I hope we will yet see independent states of Catalonia and Scotland.